I was more than happy to accept an invite to the Canadian National Exhibition! 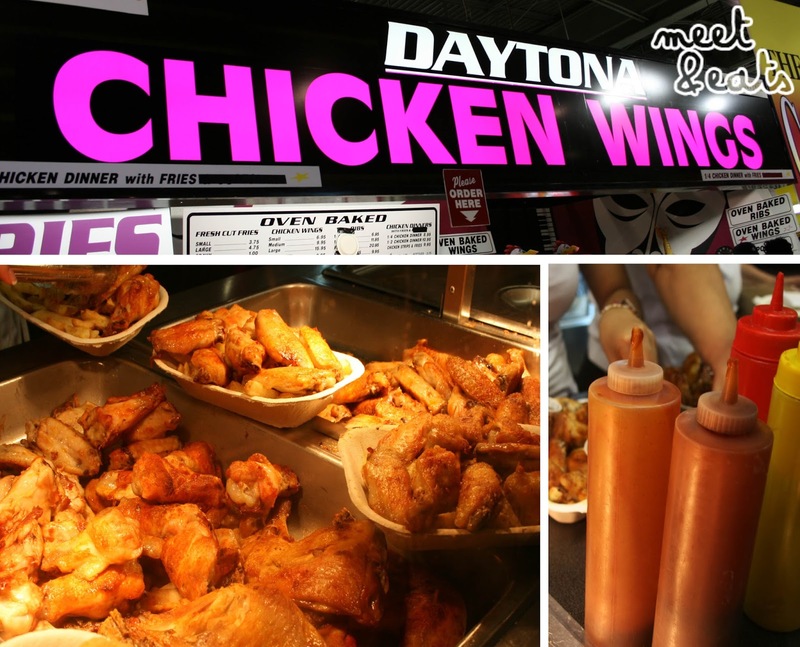 I've been wanting to go to this place since I first heard of it! And scrolling through these Toronto food Instagram tags wasn't helping my urge either. On the last day of CNE and half soaked, we merrily skipped towards the gates of CNE. I did not know what to expect! The only few fairs I've been to are the Easter Show in Sydney... and Buskerfest, if that counts. But, oh boy, those do not compare! CNE is on a whole new level of awesome. 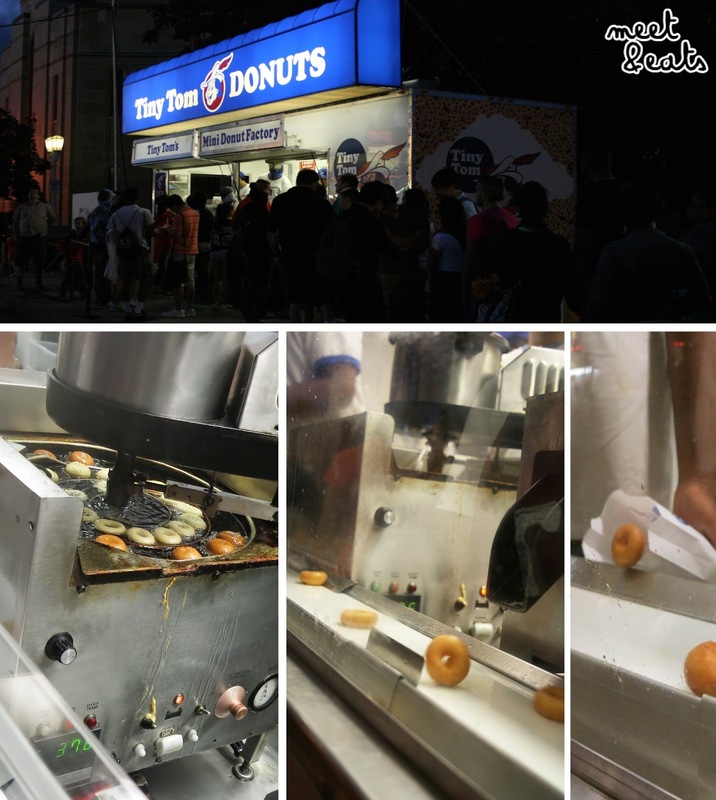 Deep frying all you could think of - the typical Mars bar, Oreo, Twinkies and even Butter! And, being in Canada, you would only expect to experience a bit of bacon in everything, so here, they also have Chocolate covered Bacon! You don't think that's out of the ordinary? Well there's also a 'Spice Cream Cone' which consists of a pizza dough in a cone shape, filled with ice cream and sprinkled with chili flakes & bacon. What the hell. Now, let us proceed to my Meet & Eats experience at the Canadian National Exhibition. Oh yes I did. 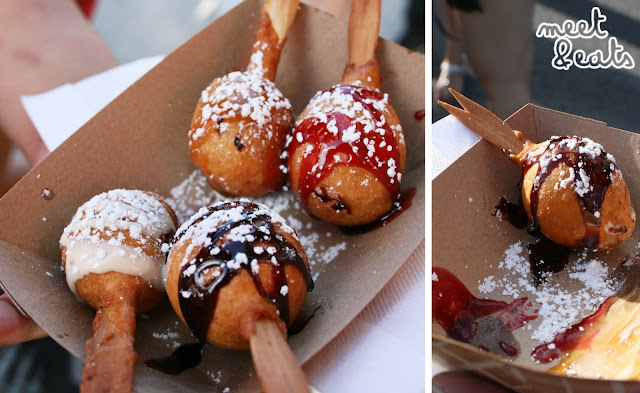 Butter deep-fried in a sweet batter, drizzled with assorted syrups and icing sugar. With my first bite, I expected my mouth to be oozing in butter, but it was hardly that. It was just a delight to bite into, the saltiness from the butter and sweetness from the batter, came together nicely. One was more than enough. The display of the wings were absolute eye candy. Look at the array of sauces! BBQ and chili. It would be a sin not to eat more than a couple of these. It was perfectly seasoned, I didn't want to spoil the flavours with the sauces provided on side. I just wish it was slightly more juicy, then it would get a definite five potatoes from me. 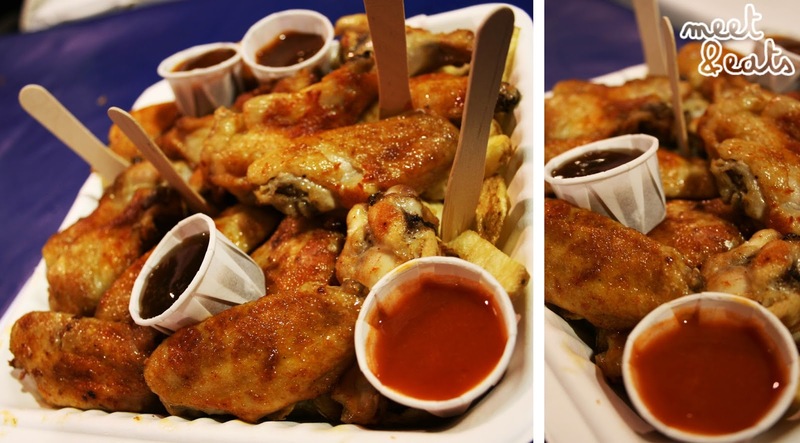 It was great double ending the sauces with the chips. Chili and BBQ was my favourite combination! Hold up! I've been eyeballing this plate of treasure since it first popped onto my Instagram feed a few months ago. This is unreal, I can have a taste of it now?! 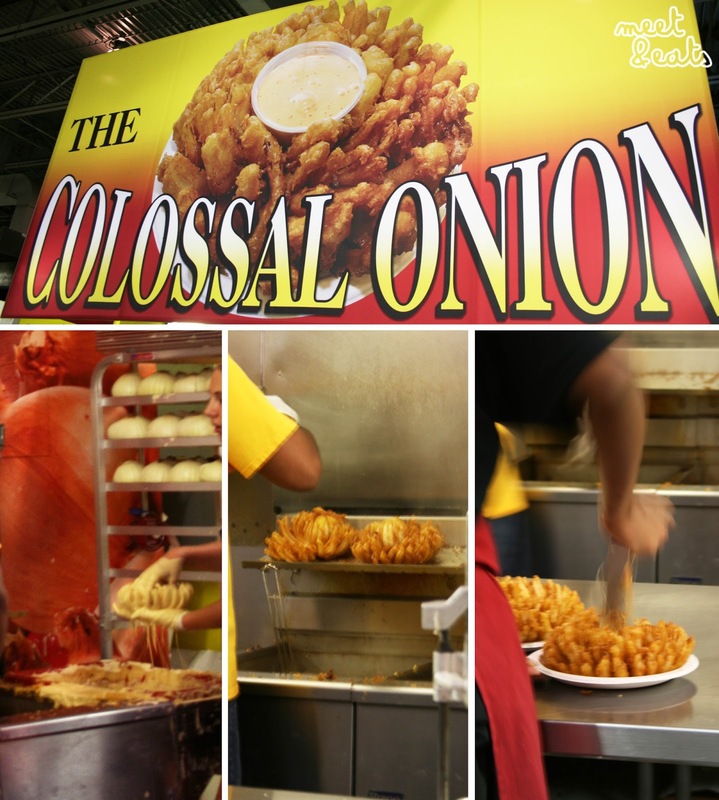 I am in love with onion rings... and, onions in everything in general. This feels like an absolute (fatty) dream! I will let you in on some top secret photos (wink), Slicing their onions in 16ths? 20ths? 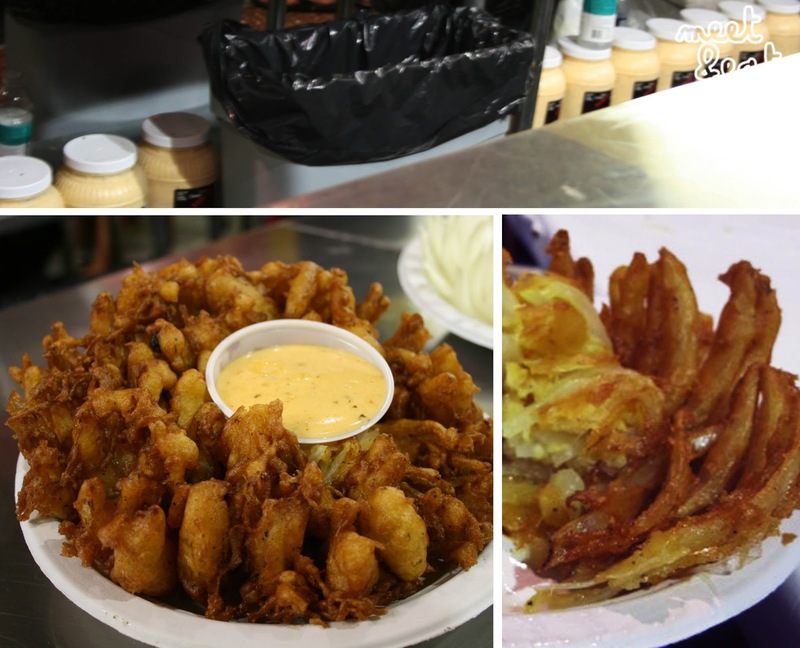 With a metal-magic-maker-ma-bob, then dipping into seasoned batter (as pictured), popping into the fryer, and using some other metal thing to get the middle bit out for easy peeling, and a spot for the sauce! WHY HELLo there. Where have you been on my life. You have peeled apart perfectly, inner Alice has shed a tear. It was crunchy and great with the Chipotle Sauce. The well seasoned batter was fantastic to have alone also! Only the outside was fun to eat though, the bottom was way too oily. But I am still super happy. What has been done tonight should not be spoken of again. Yes I ate a Krispy Kreme Donut Cheeseburger. 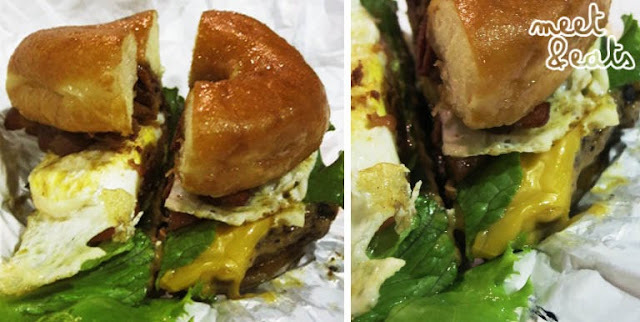 Consisting of 2000 calories, it is made up of two Krispy Kreme Donuts, a Beef Patty, Cheddar Cheese, Tomato, Lettuce, Egg and slack bits of hard Bacon. My tastebuds were very confused as to why I would do such a thing. I thought that I would do sweet and savoury well (Prime Example: Maple Syrup on Fried Chicken), but... I guess not. I would have done perfectly without the super sweet and sticky Krispy Kreme Donuts. The Beef Patty, was to be honest, perfect on it's own, it was so good! As for the Bacon bits, they weren't great to pair with either, way too over-cooked. When I first had a glimpse of this creation. I knew I wanted it, and that I would love it. 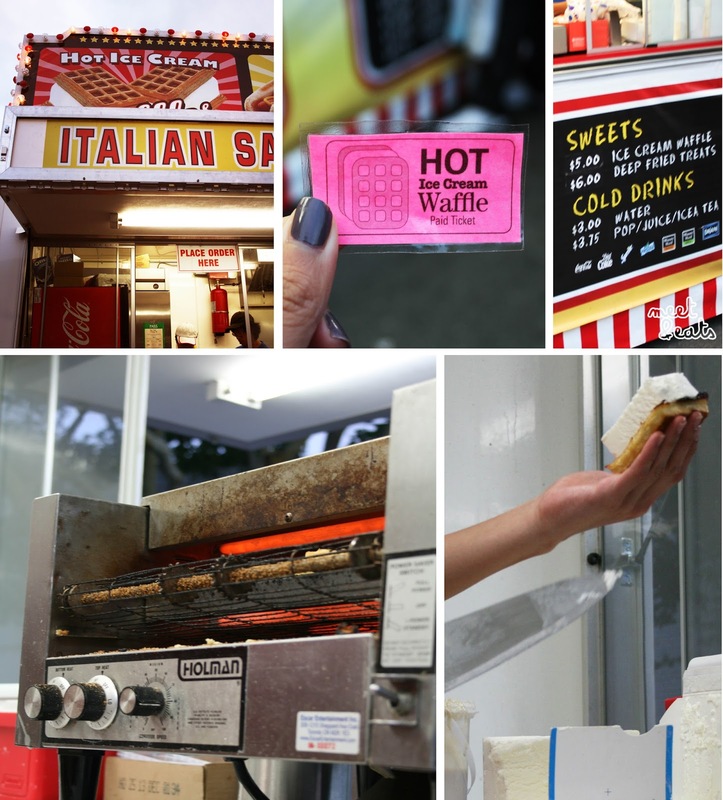 Finally making our way out and about, we went in search for the glorious Hot Ice Cream Waffle. Five dollars later, and chatter of a few doddily workers, we watched the process of the two pieces of waffles being chucked into the rolling toaster and the fella taking out a box of ice-cream from the freezer. We watched as his glove-less hands touched our pieces of waffles and with a knife, he slid the chopped piece of ice cream on. And we heard as he asked us if we had bitten into it yet before he was to cut it in half for us. You are funny. Nonetheless, it was indeed, fantastic! 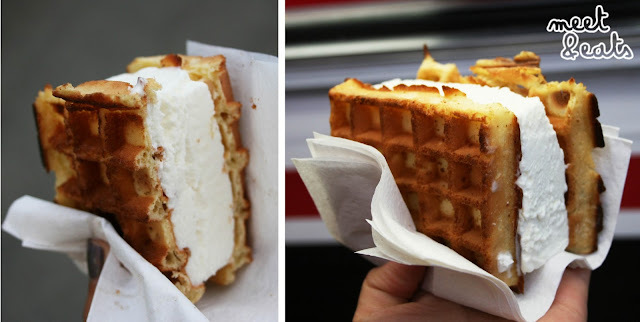 I'm sure everyone has tried waffles, and ice cream... Now imagine them together! The soft, toasted waffles with the sweet vanilla ice cream. Way too perfect and simple. Oh boy, how much watching these donuts remind me of KK's @ Orange Grove. But these were mini, and so much cuter! I have heard a lot of banter about these little treasures, and after winning in one of the Water Gun games (Annnnd winning a Hello Kitty toy, ahem ☺), the loser was to treat Tiny Tom's! 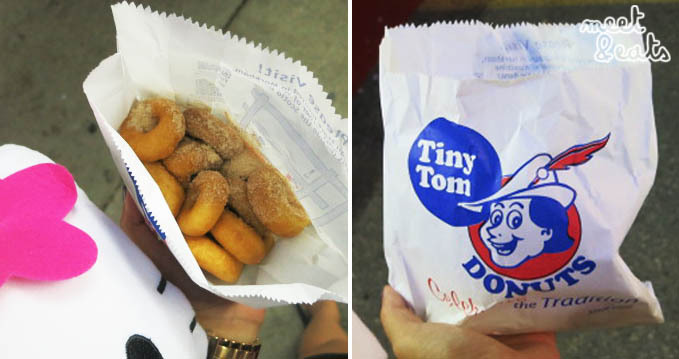 These Freshly Fried Mini Donuts are dusted in your choices of Cinnamon, Chocolate, Apple & Cinnamon or Powdered Sugar. I had to go for the Cinnamon. There is no going wrong with that! Here is me, proudly holding my Hello Kitty plushie and Tiny Toms in one arm. These were little puffs of joy. 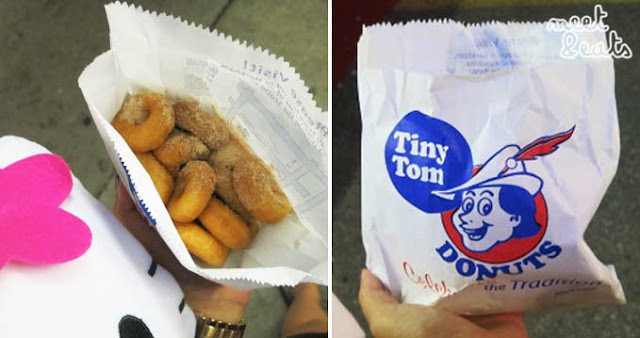 None of that dough-y, cakey texture you get from normal donuts. These were tiny, meaning that they were puffy and slightly hollow on the inside. So, so good. And that concludes my eats of CNE 2013! I was so full, but still wanting a Fried Mars Bar.... Next time.